Kyrgyzstan is home to one of the most unique lakes in the world. 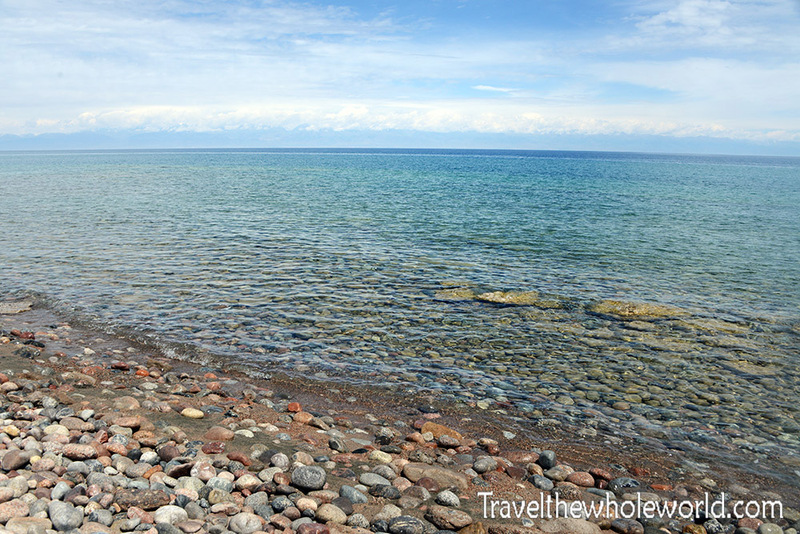 Lake Issyk Kul is special in many ways; the lake is the tenth largest in the world by volume, it’s the second biggest salt lake after the Caspian Sea, and is also the second largest mountain lake in the world after Lake Titicaca. Even when the lake has deep snow on its shores in the winter, the lake never freezes because of its salt content. Furthermore, there supposedly are a few ancient villages that are now submerged after the lake gradually rose over the past few centuries! These two shots above and below show pictures taken from the shore. 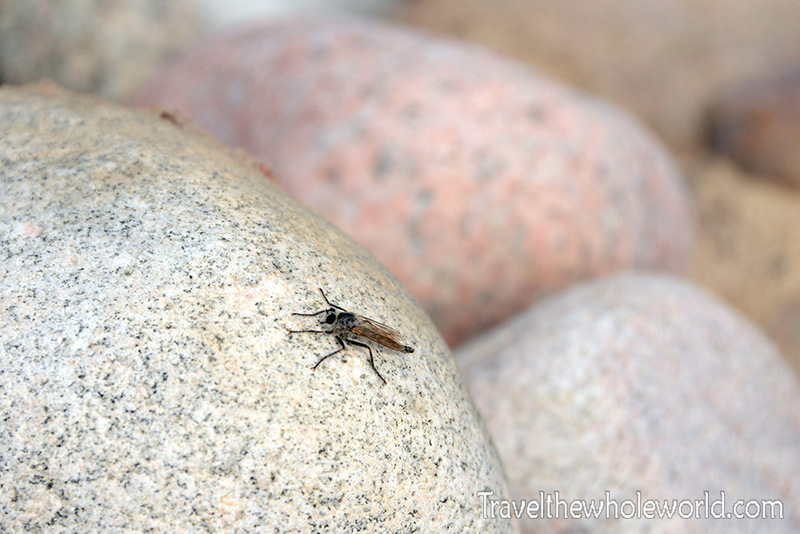 The immediate landscape surrounding the lake has a wide range of diversity. The first area that I visited wasn’t too much to look at. I found mostly dry land with a few shrubs here and there. This terrain almost looked more appropriate in a desert rather than a cold, high altitude lake. The same can be said about the actual shoreline of the lake as well. 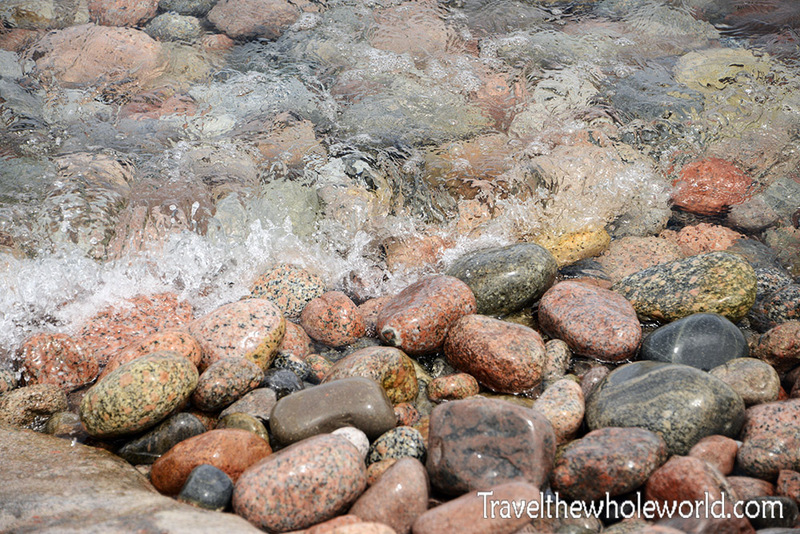 I walked along the shore at several different points, and they were vastly different. Some where sandy beaches while other spots were less impressive. 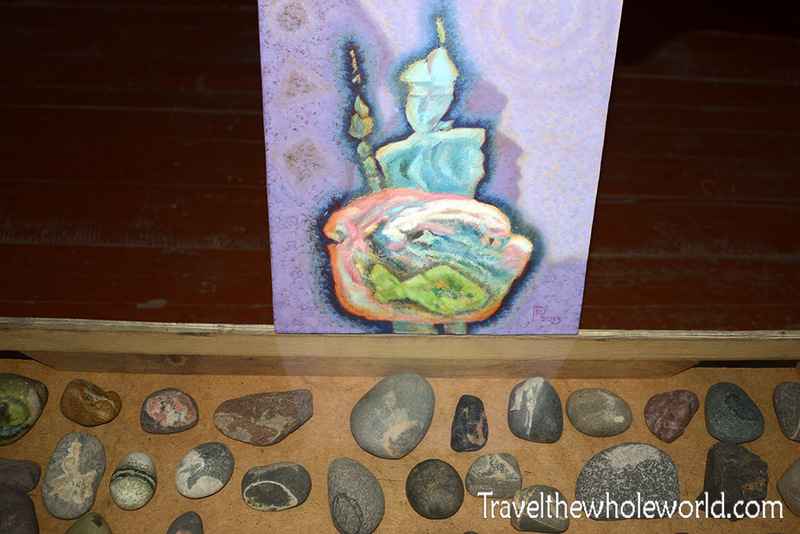 My favorite was this section above, a long stretch of beautifully polished colorful stones. I know the lake is often a good source of fish for the locals, but I never saw anyone fishing or even any boats out in the water. Regardless, if you are visiting here and have plenty of time, it may be worth grabbing some fishing gear and chilling out on these fishing chairs for an enjoyable experience. I know that there are a few endemic fish here that are endangered from over fishing and other species that were later introduced. Since the area around the lake is mostly dry shrubs and lacks trees and freshwater, I didn’t see many land animals here. 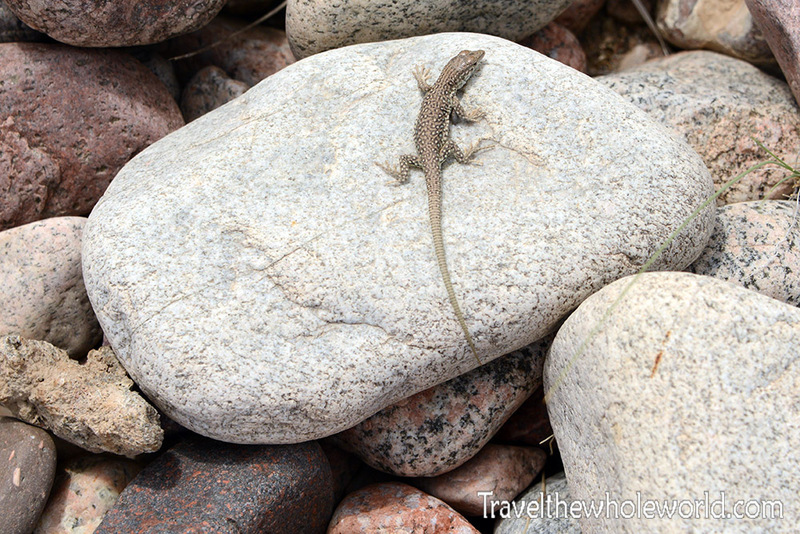 While doing some simple hikes I came across lots of lizards and giant dragonflies, but that was about the extent of wildlife I saw here! 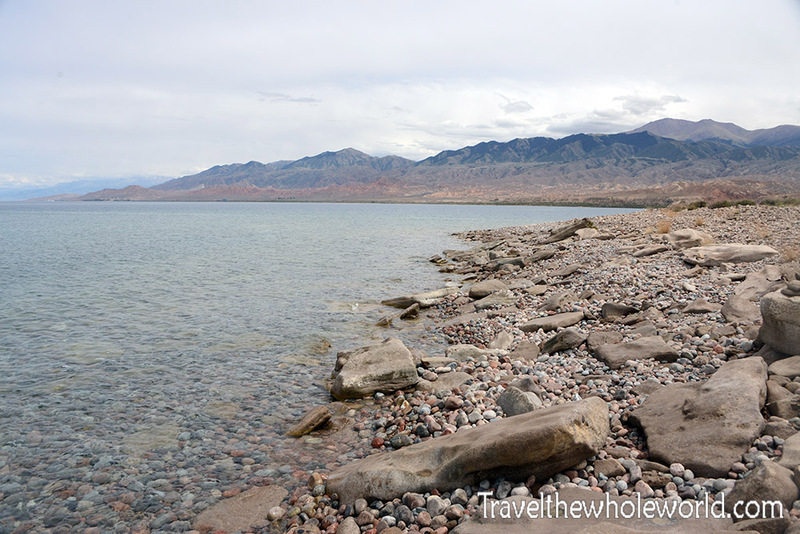 My visit to Lake Issyk Kul mostly meant visiting the small towns and scenic features off the shore. One of the first places I went to was the small city of Bokonbayevo. Bokonbayevo is mostly a good base for travelers trying to visit the lake or pass through the mountains south of here. I didn’t spend the night in Bokonbayevo but did make a day trip out of it. The city’s large World War II memorial is photographed above. I couldn’t find any information on the memorial, but it’s pretty big for such a small town and place that was so far away from the war. I assume it’s a memorial to those from the region who joined the front lines and lost their lives. What originally got my attention were the mobs of children running around the memorial photographed above and below. I happened to visit on June 1st which is Children’s day in Russia and former Soviet countries. 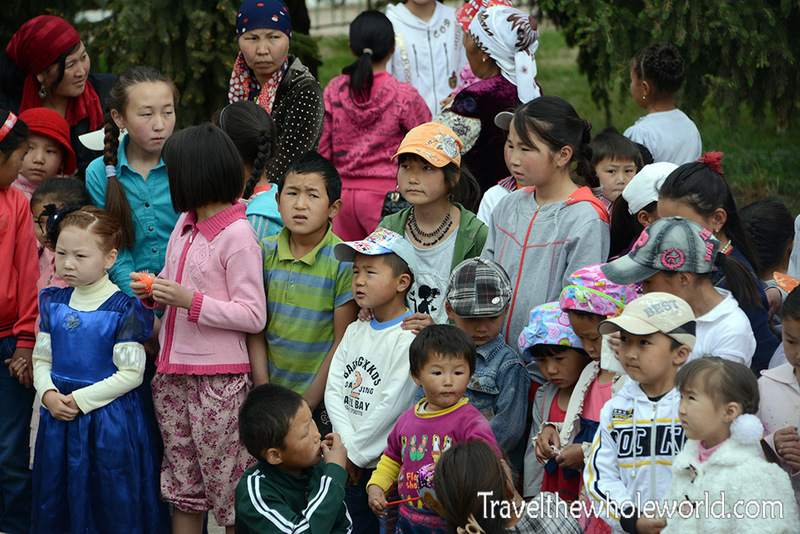 The crowds of kids appeared to be multiple field trips of school kids. There were several teachers leading the kids around and occasionally stopping for talks. Too bad I couldn’t understand. If you’re also ever in Bokonbayevo, I highly recommend stopping by this local painter’s studio. He’s got a lot of artwork on display in multiple rooms, and he even gives classes to local children. What makes him really creative to me was how he comes up with his ideas for his paintings. 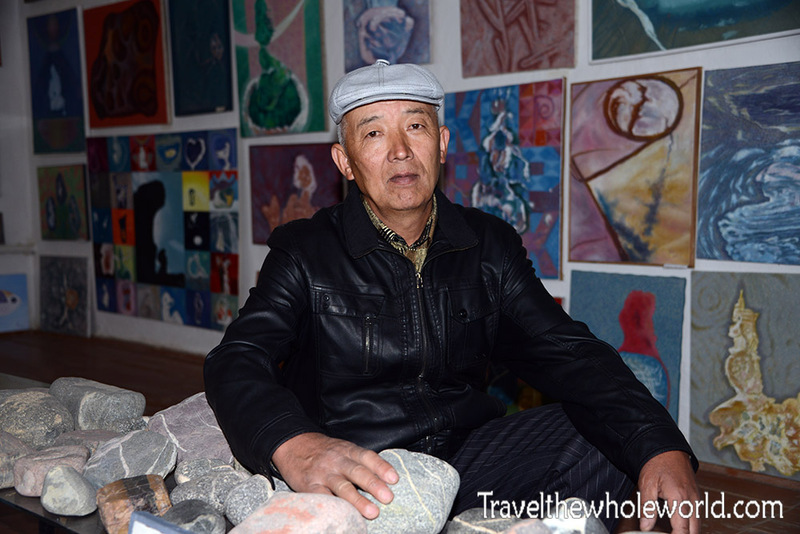 His artwork is based off unique stones that he finds from the shores Lake Issyk Kul. Patters and lines off of the rocks inspire his imagination, which he then paints. This includes every single painting you see behind him. For example, he saw himself in second rock in the top center in the photo below, and painted this on canvas. 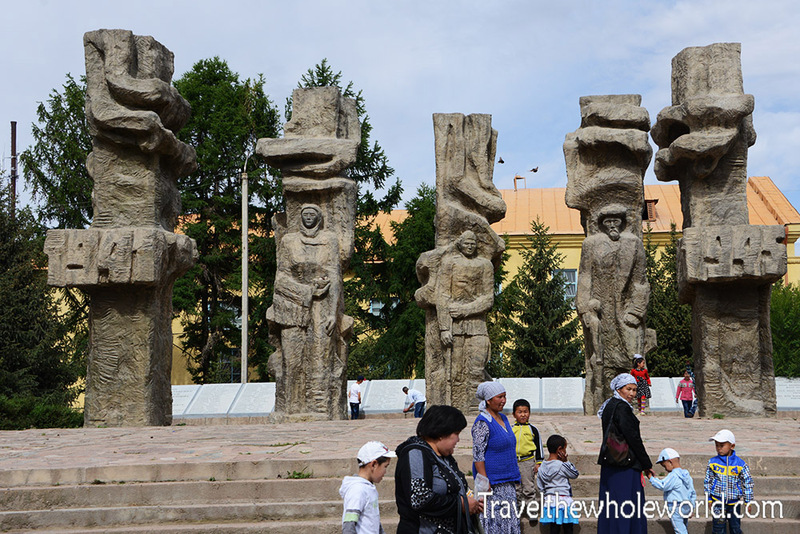 The culture along the lake and outside of Bokonbayevo is some of the best in Kyrgyzstan. 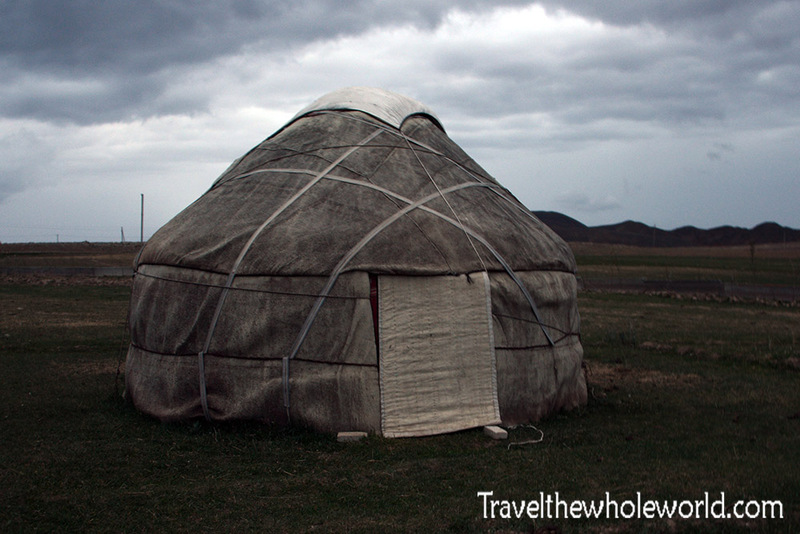 Yurts used to occupy the entire country hundreds of years ago. 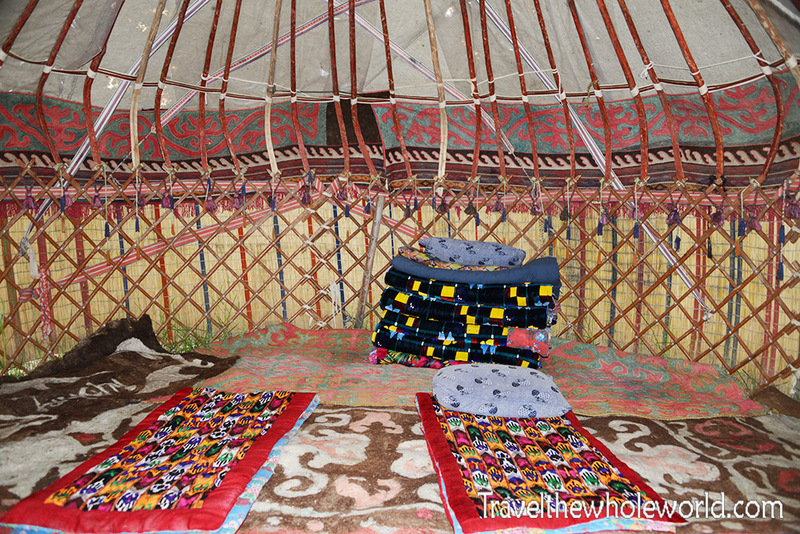 While modern housing is now the standard, yurts are still common. I stayed in a yurt which only cost me $10 a night. This family photographed above owned several of them that they rented out to travelers. 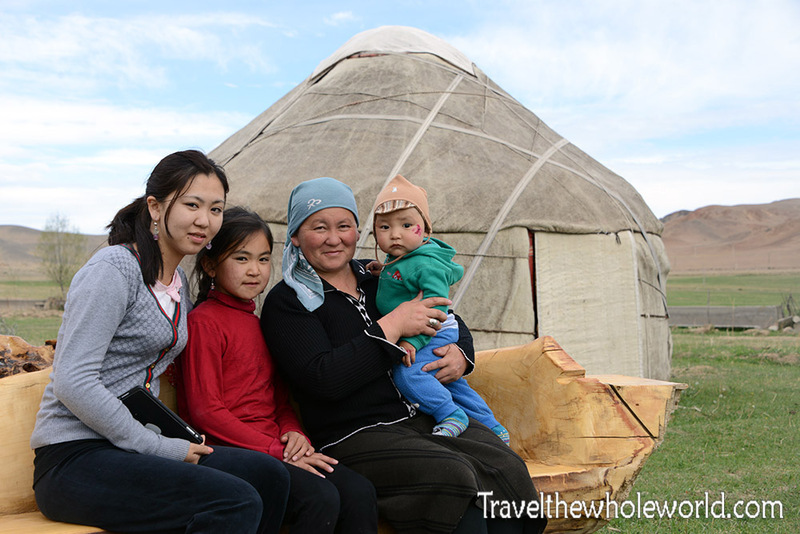 The family was very hospital, making breakfast and dinner for me and two other guests who were in another yurt. 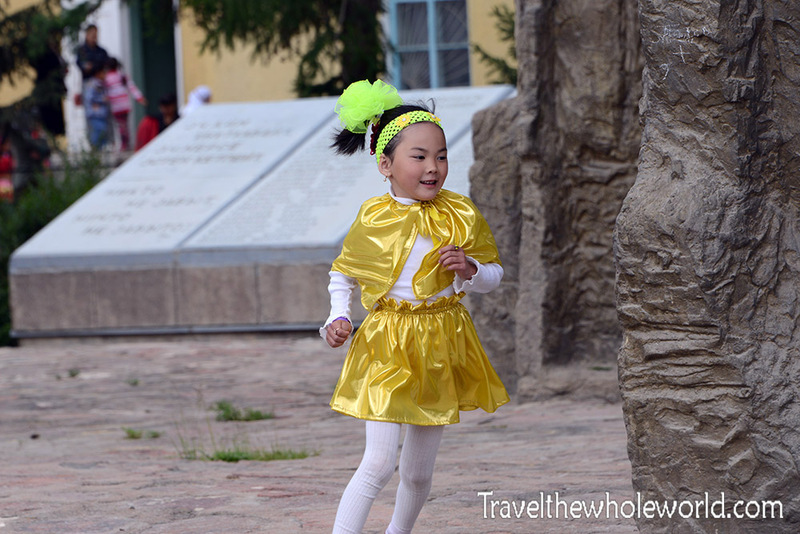 Every night their younger daughter put on a traditional Kyrgyz dance! Another place I visited was actively building a yurt. The people were nice enough to show me some of the steps that they go through. 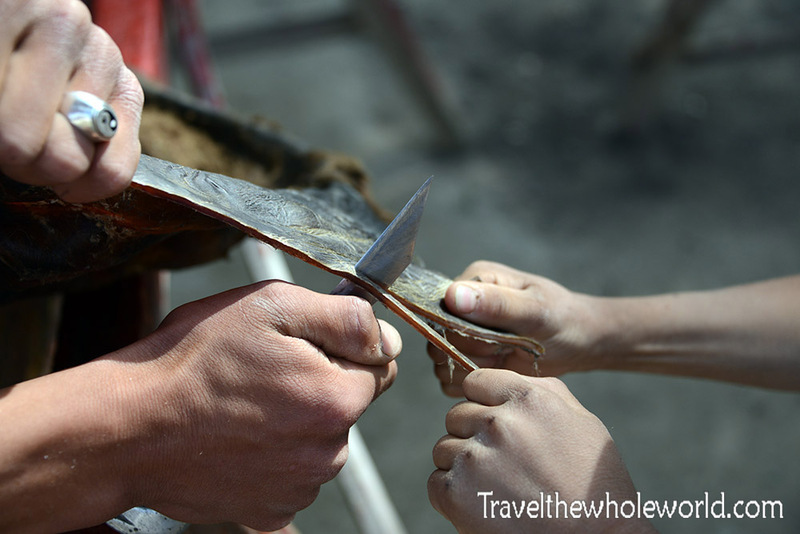 In the photo above they are cutting a hide from a cow which is used as a sort of a short rope to bind some of the materials together. Building a yurt certainly takes skill, but when it’s all said and done they are relatively easy to take down and set up again. They sort of act as giant tents in a way, and for nomadic people that roamed the plains this was essential to their lifestyle. That night some bad weather roll in, and I can confirm that the yurt protected me from the elements. I met two French siblings who were traveling here as well and were in an adjacent yurt next to me. I had my own yurt for myself, and and you can see from the photo below it was quite spacious. I assume you could easily get a dozen people in here or more if you made the most of the space. 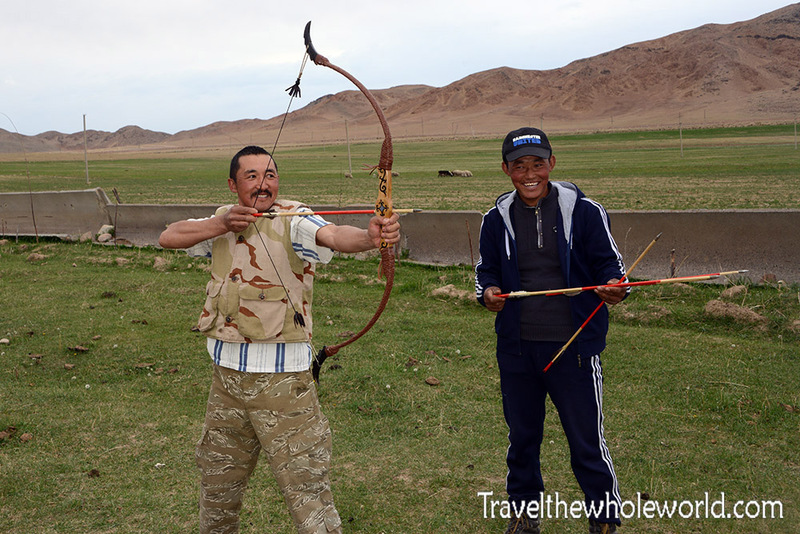 Since Kyrgyzstan has a traditional nomadic culture, archery was always an important part of their way of life. The majority of the population did not raise crops and tend farms and hunting game was their main source of food. 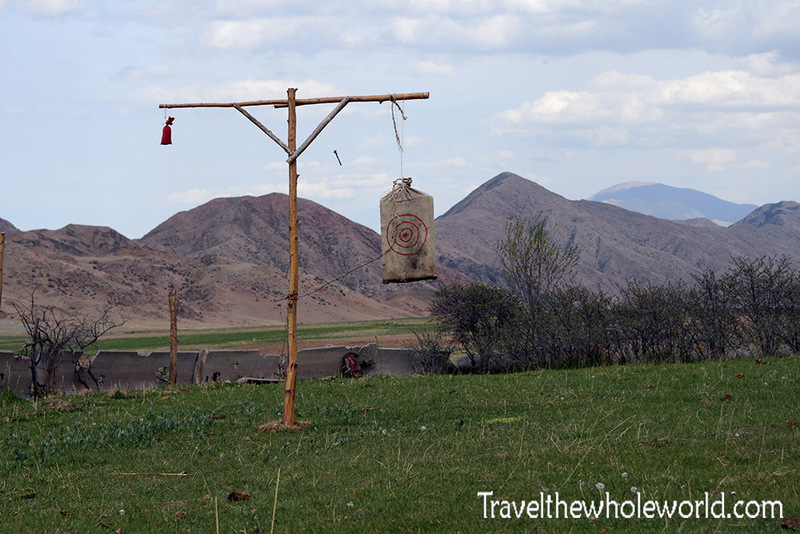 Later on Kyrgyz people got creative and began using eagles to do the hunting for them, but archery is still known by some. 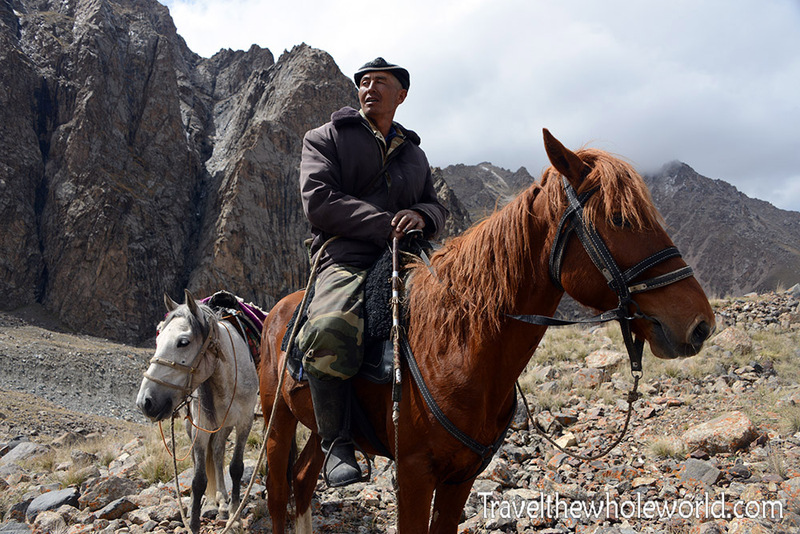 This local Kyrgyz man was the owner of the yurt I was staying in. Above he demonstrates his skills on the target below. He gave me some tips and I gave it a try myself. It was pretty hard even though I felt I was pretty close to the target. On the first go all of my arrows missed the target completely except the last one. On my second round I did much better! 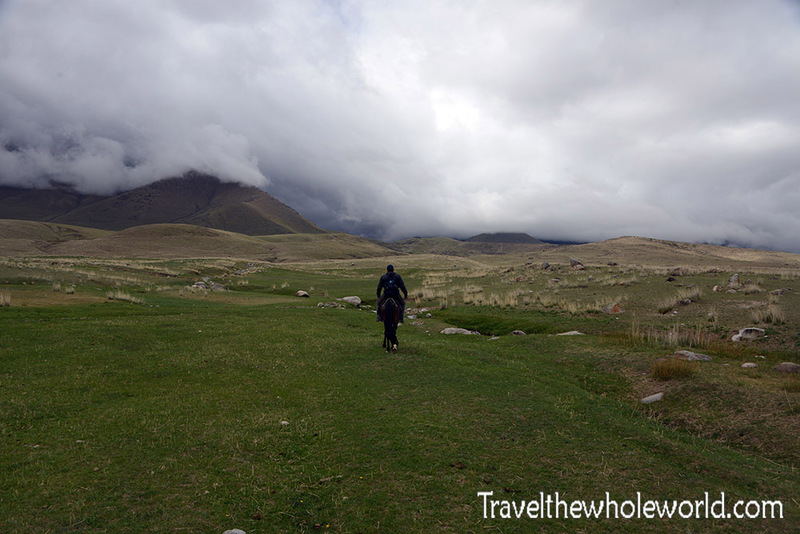 I obviously spent a lot of time here, because in addition to yurts, archery, and the lake, the family also own horses that you can take out into the mountains. I did an all day ride that began with this lazy horse. 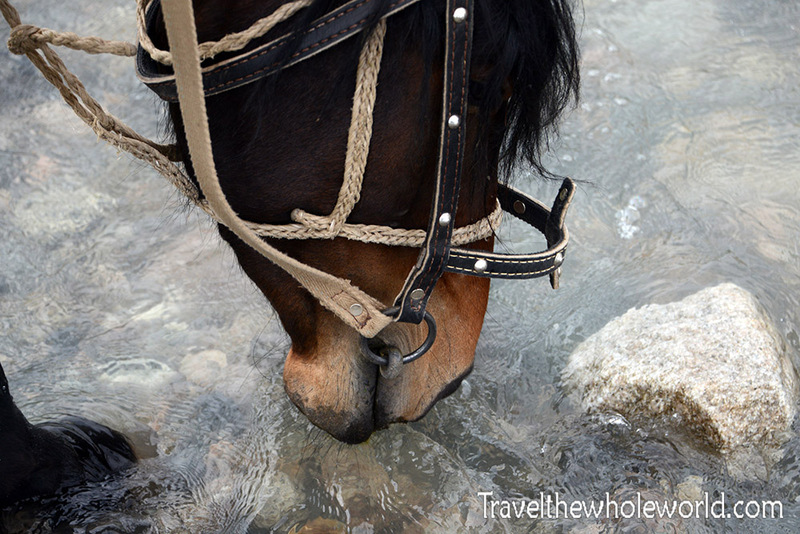 The ride started off easy enough; going through rolling hills and crossing small streams where our horses would always stop to drink. 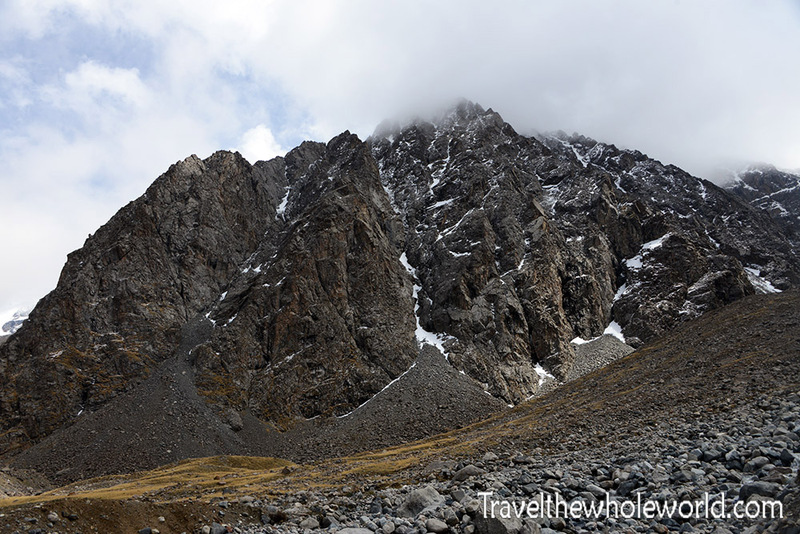 As we climbed higher into the mountains we finally started to approach a wall of clouds. When we first entered the clouds, it was pretty much nothing but light fog. It never seemed to be too dense, so I wasn’t expecting any rain. I figured if anything the sky would clear up soon! After another hour or riding, the temperature dropped significantly. I didn’t think there was a chance of rain, and hadn’t even considered the possibility of snow, but that’s exactly what happened. And it was nearly June! The snow started off as flurries and eventually transitioned to heavy snow. We were riding directly into the storm so even with my hood down my face kept getting hit by snow that seemed to be coming in horizontally. It was too warm for the snow to stick, but it was much colder than I had planned on. Eventually I started to get so cold and my hands were having trouble holding the reins. Being that this was just a day trip, I hadn’t brought many extra layers with me and now was paying the price. I was seriously starting to get dangerously cold, to a point where I’d maybe even get hypothermia if something didn’t change. Right when it was getting unbearable we made it to a shepherd’s house. 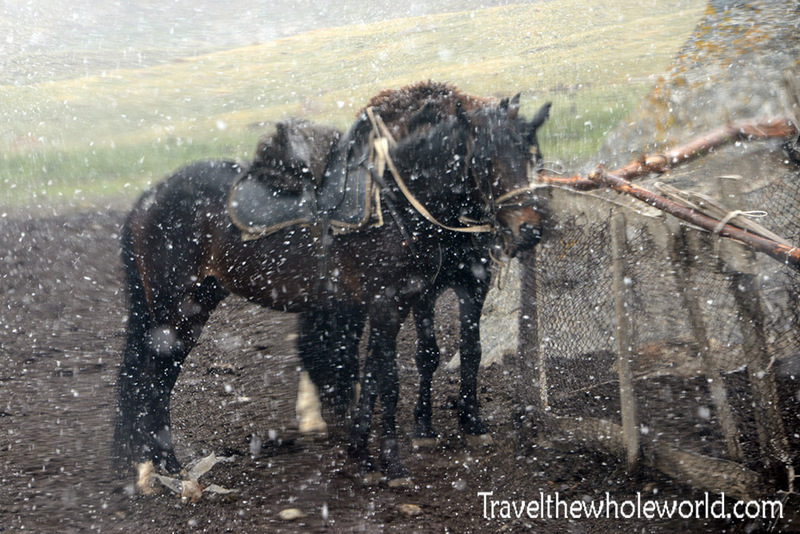 We tied the horses up and we warmed up inside the house by a hot stove. Here I had a hot lunch with tea, and after about 20 minutes I stopped shivering. By the time we were done with lunch, the snow storm had completely ended. The skies were left with a light overcast and I could even see blue skies further down the mountain where we had started. We took off again and continued our ride. The entire experience was much better without the snow coming in. It was amazing how quickly things can change in the mountains. I actually started to get hot and took off some layers so that I was only in a t-shirt. Above is some of the terrain we crossed as we got higher. The photo below is of a local shepherd and his son. 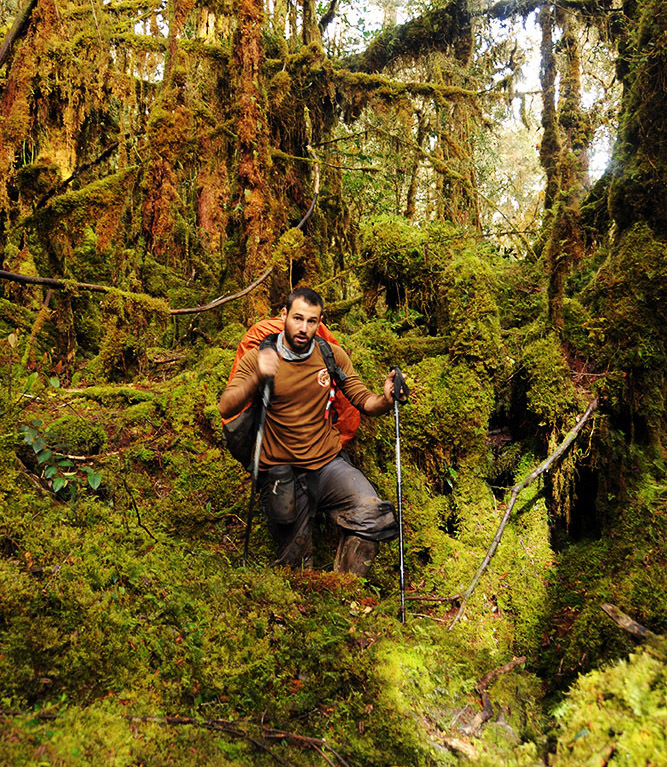 Once we got deeper into the mountains, I began to hear a high pitched calling coming from all directions. 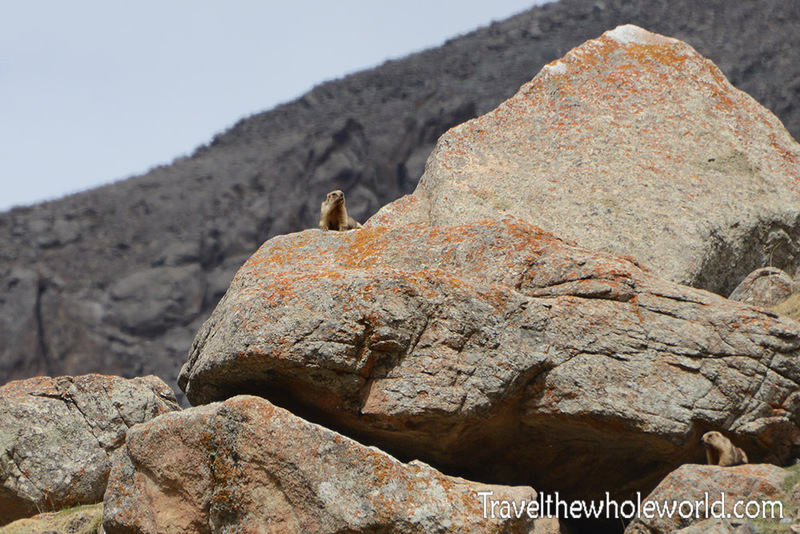 It kind of sounded like a bird to me, but as it turned out it was marmots. 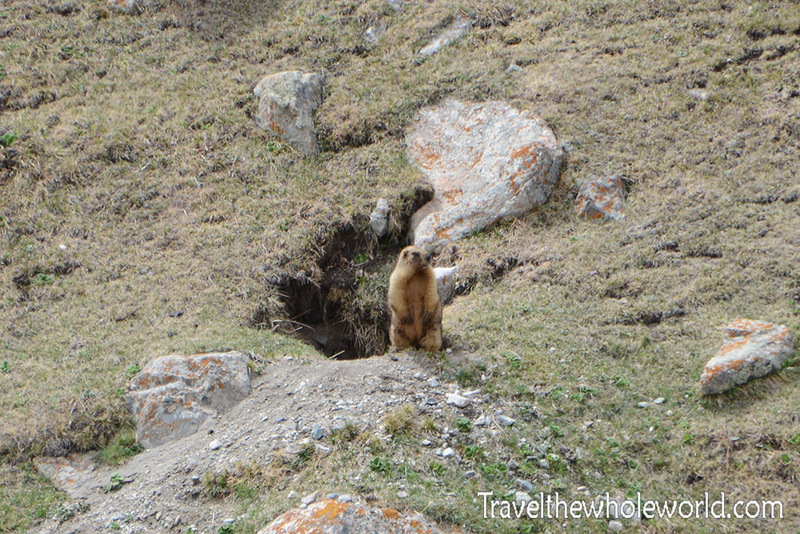 These guys were everywhere, coming in and out of tunnels they had dug or appearing on top of large boulders. One of the shepherds dogs had followed us from the village, and every time he saw a marmot he took off charging towards it. They were a bit difficult to photograph because these guys were so cautious, and the dog wasn’t making it any easier. Luckily I had my zoom lens so I was able to get some kind of photo of them from a distance. 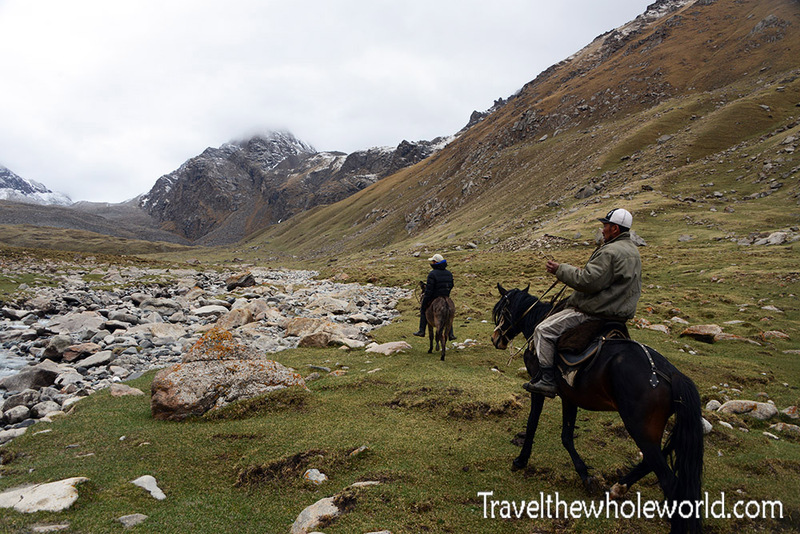 Higher up in the mountains we found some other locals on horseback. This man was with a small party and they were actually hunting. I love how not much has changed here. Hundreds of years ago, and maybe even a thousand, men would have also rode up here on horses to go hunting as well. Further up we found yet another group of hunters who had just killed a mountain sheep and were actually butchering it on the spot. In order to bring their kill back down to the village they had brought an extra horse on the ride up. 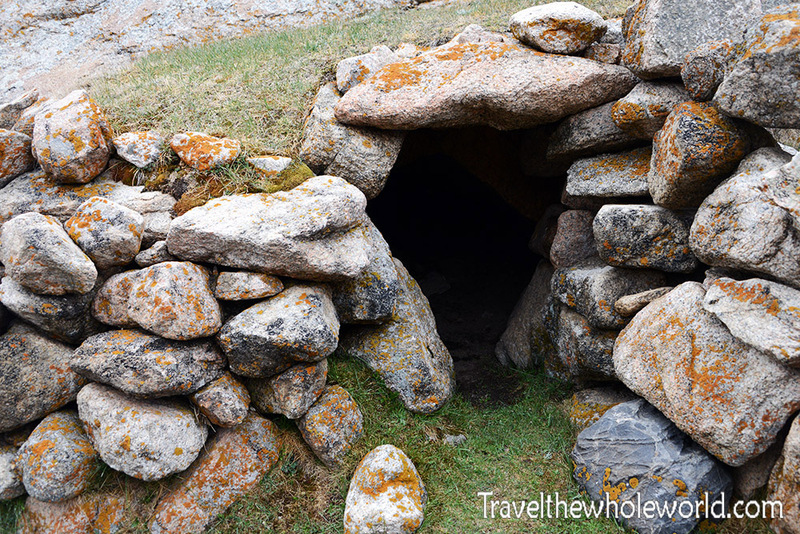 I was told some of them even spend the night up here while on hunting trips, and make use of this little cave above. It’s a good place to escape the elements, and would have been perfect for me earlier in the day when the snow storm was coming it. I imagine this is used a lot for those who come up here during the brutal winters when they want to escape the winds and cold. 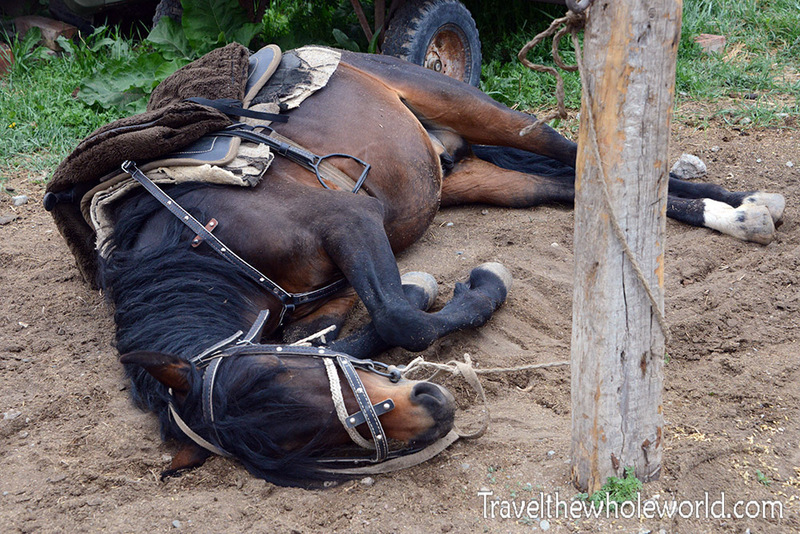 After a certain elevation the terrain got too steep for the horses. We had to tie them up and continued the rest of the way on foot. I’m not sure how high we got, but I’d say we definitely went over 10,000 feet (3,000 meters). I was glad the weather held up and we didn’t get anymore snow or rain in the afternoon. This base of this mountain photographed above was our stopping point. It felt like we had rode a long way and were incredibly far from Lake Issyk Kul, but even from here looking back down the valley you could still see it! 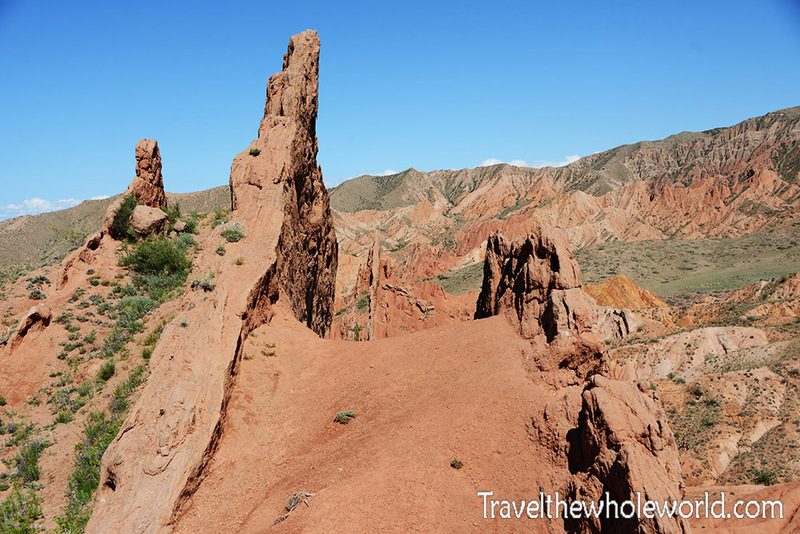 There are so many beautiful places I saw in Kyrgyzstan that it’s hard to pick a favorite. 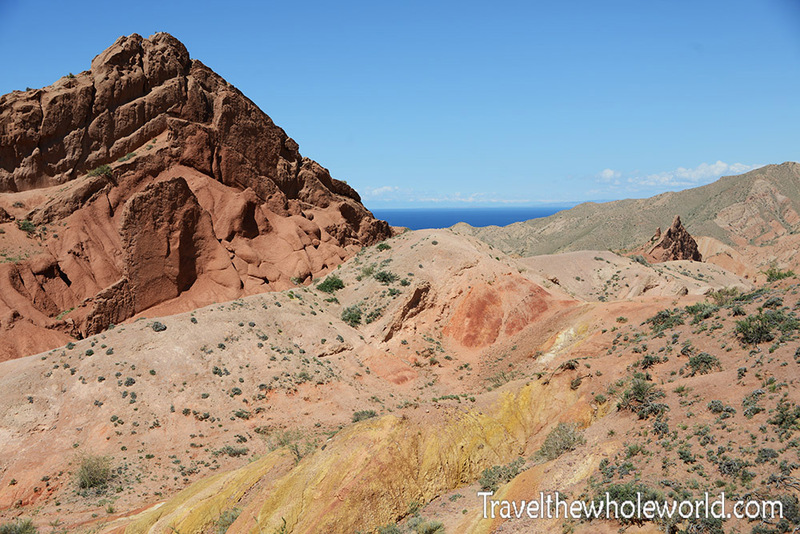 Another highlight was a trip to some of the most colorful mountains I had ever seen. 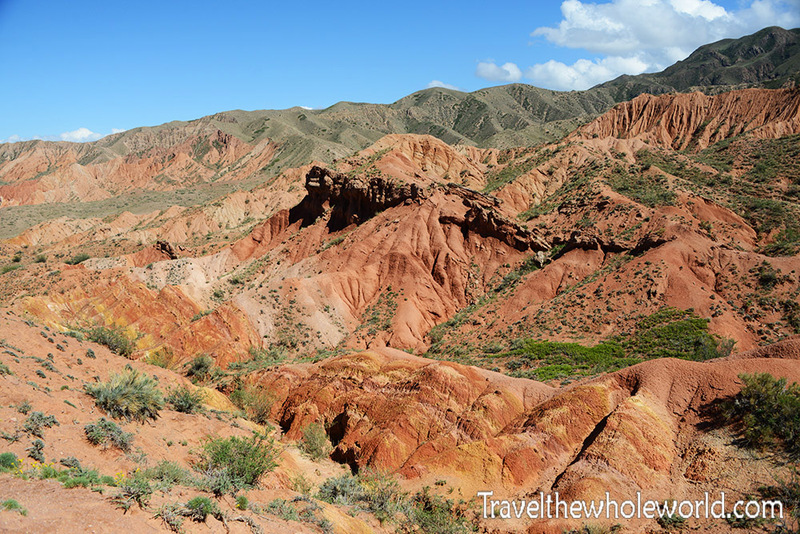 They are locally known as the Skazka canyons, but are also called the Fairy-Tale Canyons as well. 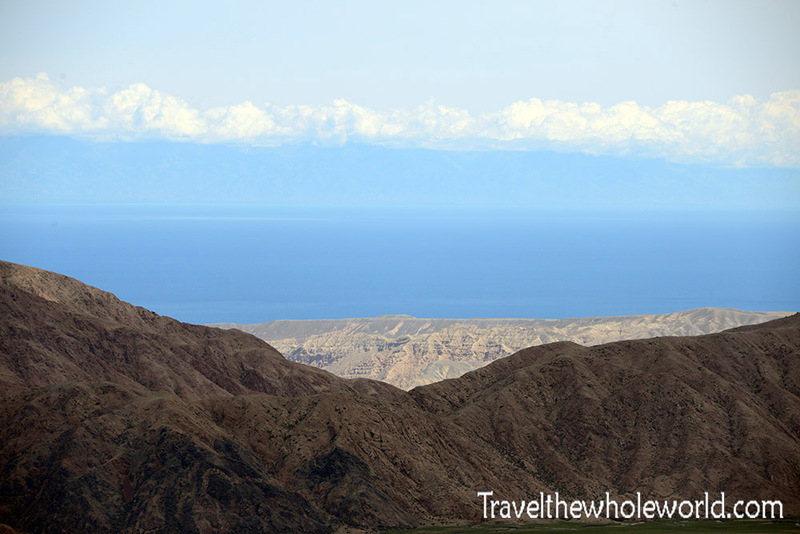 As you can see in the photo above, they are immediately off the shores of Lake Issyk Kul. The colors and strange shapes are what make this place so amazing. 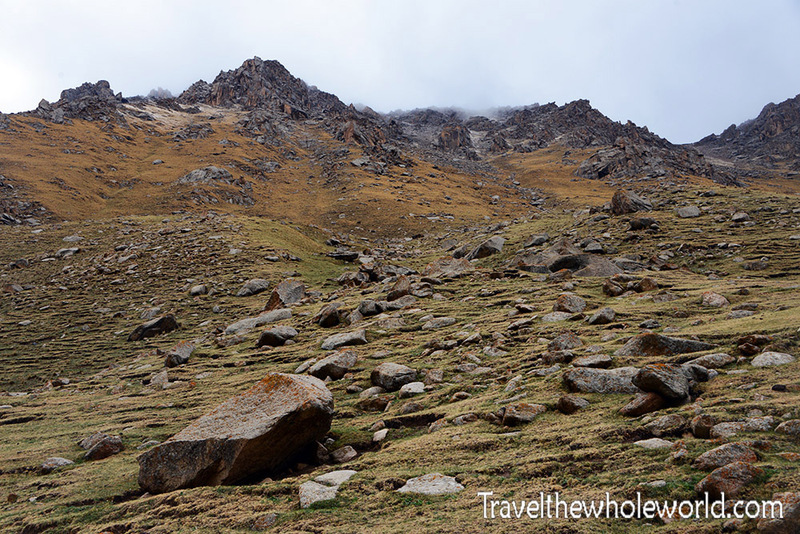 The mountains are different shades of yellows, oranges and reds and contrasted by dark green grass and vegetation. Some areas are smooth and gentle while other parts have small sharp fins protruding out of the ground. 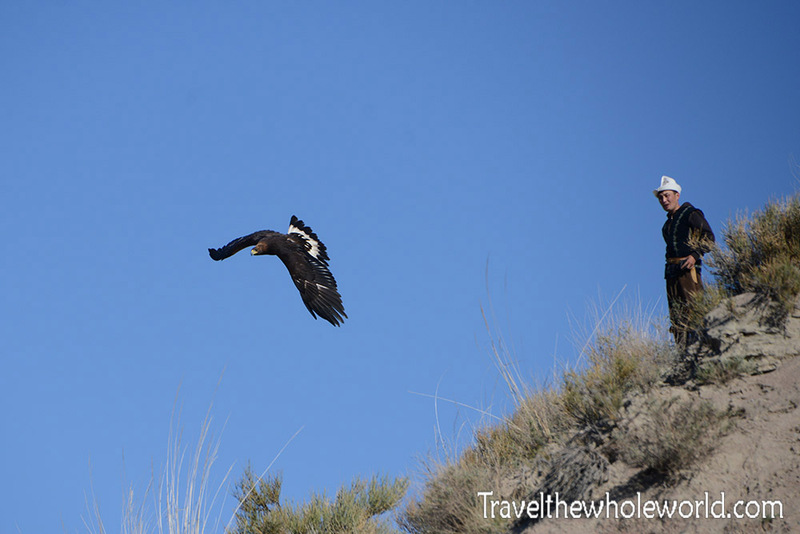 One last experience in the Lake Issyk Kul region, and of the most interesting was watching the eagle hunting in Kyrgyzstan. This type of hunting is popular throughout the country and Central Asia. As a matter of fact, there is a saying in Kazakhstan, “There are three things a real man should have: a fast horse, a hound, and a golden eagle.” In Kyrgyzstan this is true as well, and you can easily arrange a hunter to show off his eagle. They usually train them with domesticated rabbits and fox tails. The eagles can be set loose on horseback, or in this example from atop a hill. 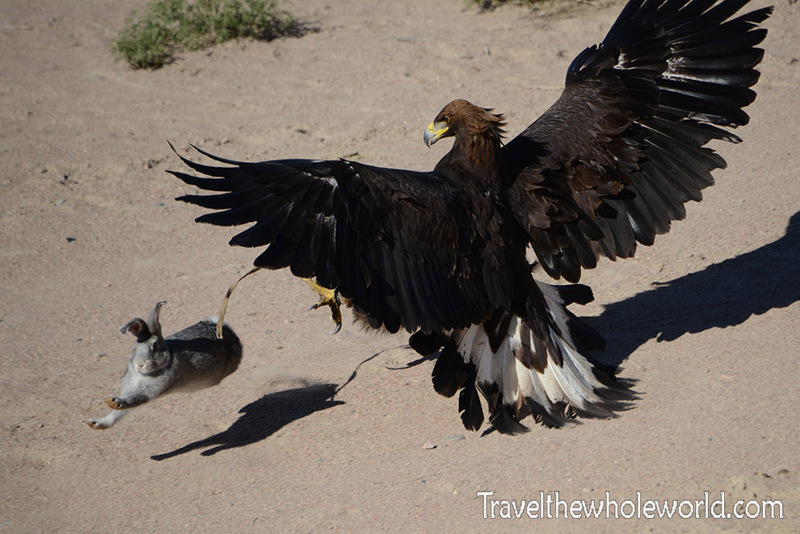 This eagle was only a year old so was relatively young and inexperienced. When he dived down from the sky the rabbit looked absolutely done for, but the rabbit actually escaped! To be honest I actually felt guilty once I saw the rabbit thrown out onto the ground for my own entertainment purposes, so his escape let me continue my trip without a guilty conscience. The hunters were able to capture the rabbit again and I told them he had earned his freedom. 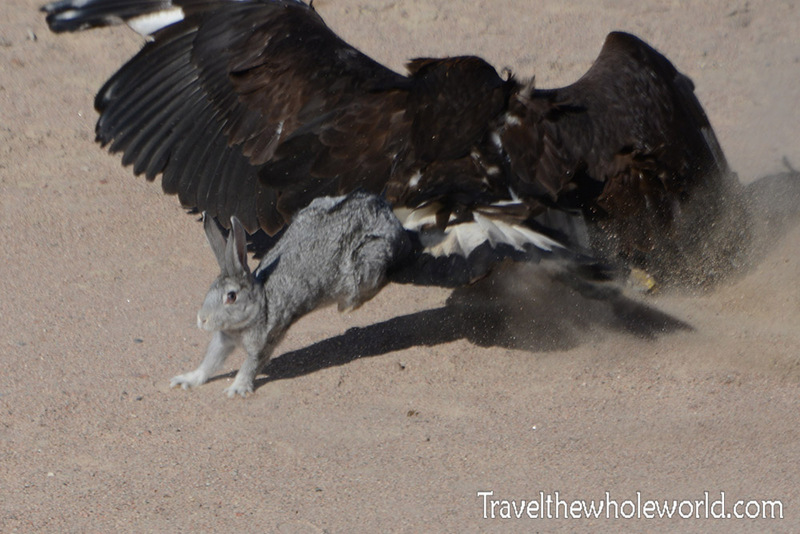 The agreed with me but still kept it, so I’m sure the eagle and the rabbit would meet again.